By using inflatable Air Cushions to lift fragile and or oversized loads or structures without causing further damage to either structure or load. 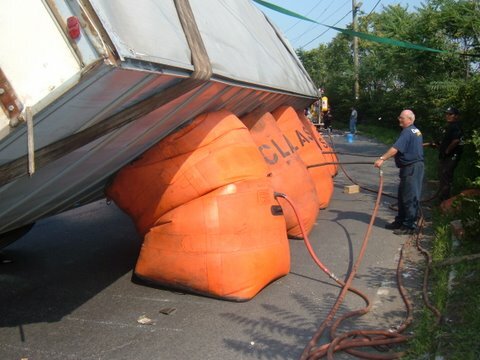 These cushions are designed so that they can be placed under the load and then inflated to start the recovery process. Tractor Trailers are prime candidates for low pressure air cushion lifting, Large Buses, Aircraft etc… All can be recovered. Our Experienced Air Cushion Recovery Crews know how to get the job done safely and quickly. Airplane recovery with and F.A.A., A. & P. are part on our staff.